Archbishop George Stack is calling for prayers for the Church in France following last nights devastating fire at the Cathedral of Notre Dame in Paris. In a personal message to the Archbishop Michel Aupetit of Paris, Archbishop George offered the condolences and support of the Church here in Wales. “At the beginning of Holy Week the people of Paris and beyond are experiencing their own Good Friday with the destruction of the Cathedral of Notre Dame de Paris. This sacred space is a symbol of the faith and patriotism of the French nation. I hope and pray that they will experience its resurrection through the faith, skill and generosity of the city and the world”. 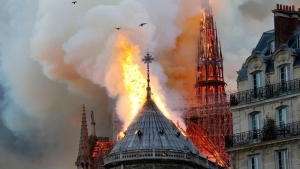 Widespread damage has been caused but the fire, which began early yesterday evening, with the roof and spire of the cathedral completely destroyed. Many of the ancient artefacts held at the cathedral were rescued. Fire fighters are still working to completely extinguish the blaze. It has just been reported that the main shell of the building has been saved.